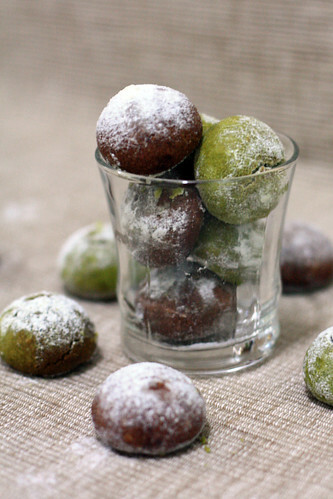 my buttery fingers: I'm Back, with Matcha and Cocoa Snowballs! I'm Back, with Matcha and Cocoa Snowballs! It's been a month. A month since school started, meaning a long lonely month without any baking done. I miss my spatula dearly. I miss carefully weighing out ingredients. I miss the familiar 'ding' sound the oven makes when the baking time is over. I miss taking photos of the end product and then munching it away with satisfaction. Being a Year 13 student is not easy, the work just comes crashing on us like waves and never stops. Even baking has to step aside as I prioritise university applications, personal statements, tests and internal assessments first. 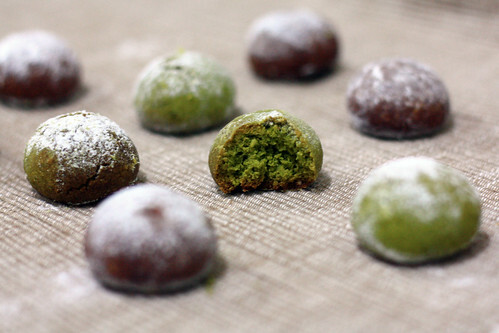 The name of these little treats might be a little confusing - the snowballs, in fact are just matcha and cocoa cookies dusted in icing sugar, so they resemble snowballs. But texture wise, they resemble snow too - because they melt in your mouth. They are so addictive it's hard not to pop these small little cookies into your mouth one by one until they're all gone! They are incredibly easy to make, and I really enjoyed making them as I weighed the dough out equally and rolled them in my palms until each was a perfect sphere. Unfortunately, maybe the oven temperature was not correct or maybe because I didn't chill the dough overnight, they flattened out a bit so they are more like, snow domes. The dough is quite versatile too - I'd imagine that the matcha and cocoa powder can be swapped with espresso powder to create a coffee flavour. Once they were properly cool and well dusted with icing sugar, I packaged them into small plastic bags as (extremely belated) birthday gifts - one for C., and the other for A., whom I chat to every single Biology lesson. So, Happy 17th to those girls! Right, so back to work for now. I hope that I'll get to do some more baking soon! 1. Using a wooden spoon, beat the softened butter and icing sugar until well combined. 2. Sift in the ground almonds and cake flour, mix well. 3. Spilt the dough in half. 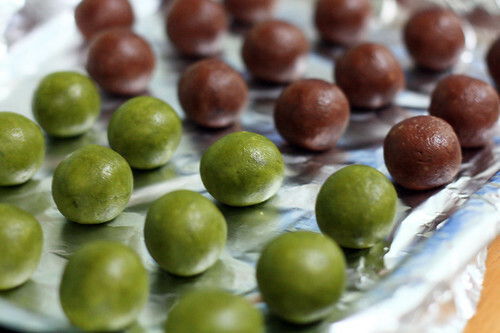 Gently knead the matcha powder into one portion, and the cocoa powder into the other portion. 5. Preheat oven to 170 C.
6. Working with one dough at a time, take 10g of dough and shape into balls. Place them on a parchment lined baking sheet. Repeat until all the dough is shaped. 7. Bake for 15-30 minutes until lightly coloured. 8. Let cool for a while, and transfer them to a cooling rack. Whilst the cookies are still warm, dust them with icing sugar. 9. When thoroughly cool, dust again with icing sugar and store in an airtight container. I am so jealous of your baking/photography skills! If only I had a fraction of your talent! Great bakes and photography as well as styling! Keep it up! WELCOME BACK!! :) Hang in there with school and thank you for taking the time to still bake and post on your blog. Another wonderful recipe, I just can imagine the wonderful silky texture of these little snowballs. Good job, like you always do. School is really hard, above all in China, I know, but you have to think you're going to finish :) At university everything will be different! ohmygosh! i have been watching your space, honest! =D so glad that your baking again! this looks delicious, and your photography is simply fabulous! Those look so good! I really like using matcha in things like these cookies. Hello, I found your blog purely based on luck - but I'm loving everything I see so far! I was searching for some recipes that called for green tea. I just have a question about this recipe - have you ever made these snowballs without the almond powder? Because I unfortunately am allergic to almonds, but I'm dying to make this. Thanks! No, I haven't tried these without ground almonds, but I think a good substitute would be ground hazelnuts, or even replace it with more flour. I guess the snowball texture will be a little different, but if you do try it - let me know the results! Thanks for the reply, Wendy! I did try this recipe using more flour instead of almond powder, and it turned out just as wonderfully. Thanks for the suggestion! Hi Wendy, would you have the recipe for just the green tea snowballs alone? 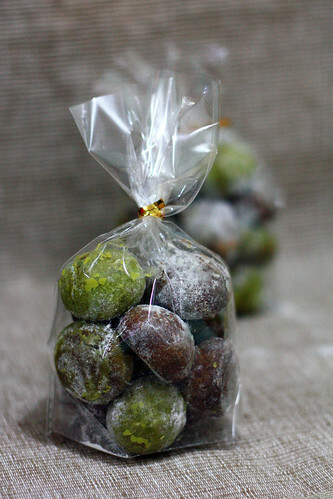 For just green tea snowballs, omit the cocoa powder and use 12g matcha powder.